There are two things that I really care about when it comes to my skin. Ugh, the word itself is just naughty. My stress levels have been higher than usual lately (I have found that champagne is the Rx for making you feel more glamorous while stressed) so I have been using ton of fabulous eye products to help keep me looking…..well, not so stressed. 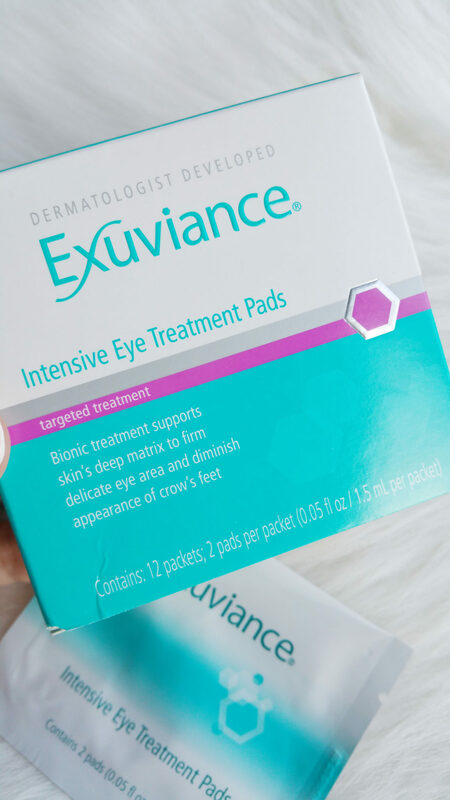 Hot on my beauty list right now is the Exuviance Intensive Eye Treatment Pads. These pads are infused with Lactobionic Acid which hydrates while it stimulates cell renewal and supports the skin’s deep matrix. HELLO GORGEOUS EYES!!!! Not only do they have this powerhouse anti-aging ingredient but it also has Pro-Vitamins A, C and E. All this firming and minimizing the appearance of fine lines makes me want to celebrate with more champagne! Just kidding, I must remember that although champs is delicious it does dehydrate the skin making you look even more tired. My eyes do feel very refreshed after using these pads, I did notice that the area around my eyes were a little tacky from the product. I don’t love having to wash off any anti-aging product that is supposed to help with hydration, fine lines and wrinkles but I found I had to rise my eye area off before I put on my makeup. I found these eye pads to be thinner than ones I have tried in the past. 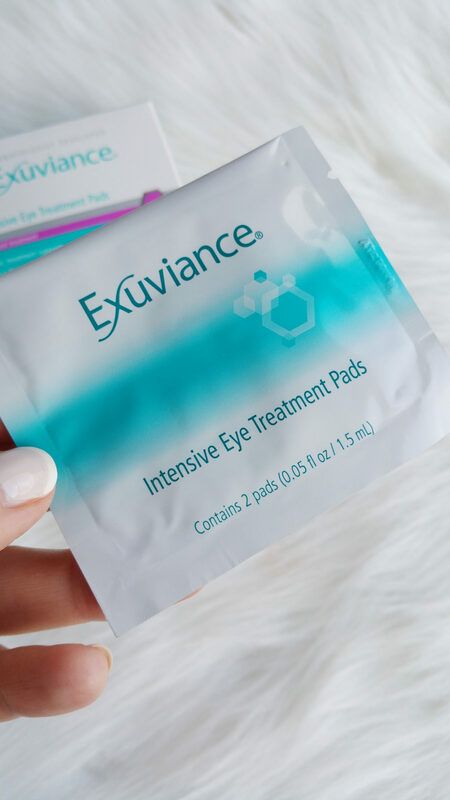 They feel more like a thin paper compared to a gel or puffer eye pad. You don’t have to worry about fragrance in this product as it is Dermatologist tested. Gently cleanse and dry the eye area thoroughly. Open pouch and remove both pads, (Each pouch contains 2 pads). Gently place one pad under or around each eye. Smooth the pad carefully on the skin. Relax have a glass of champs, catch up on all your social media gossip and leave on for 10-30 minutes. Gently remove both pads and discard. These pads can’t be reused. Gently massage in excess solution (this is where I found the product to be tacky). Apply your favorite eye cream and voila, you are looking bright eyed and ready for some glamorous makeup. Products provided for consideration by NeoStrada with no agreements or obligations to feature or review.